Imagine waking up and not knowing your name, or anything about yourself other than you had been shot and you have a laser in your leg. No really, a little laser that displays the number of a safe deposit box across the wall when turned on. If you have had this happen, then you’ve gone through the same things as in The Bourne Identity. This action/spy movie is based upon the 1980 novel by Robert Ludlum and stars Matt Damon as the lead character, Jason Bourne. As alluded to in the opening, the character awakens after being fished out of the sea having been shot. His memories are gone and he is anxious to uncover what he can about himself. After healing, he visits the Zurich bank and finds a number of IDs, money, passports and yes, a watch (more on that later). When he leaves, a bank employee contacts the CIA black-ops program, Operation Treadstone, and that’s when all Hell breaks loose. Chased through a U.S. consulate Bourne manages to escape with a Swiss woman, Marie, and begins to try to find out about his past by visiting the address on one of his passports where he is attacked by another assassin. 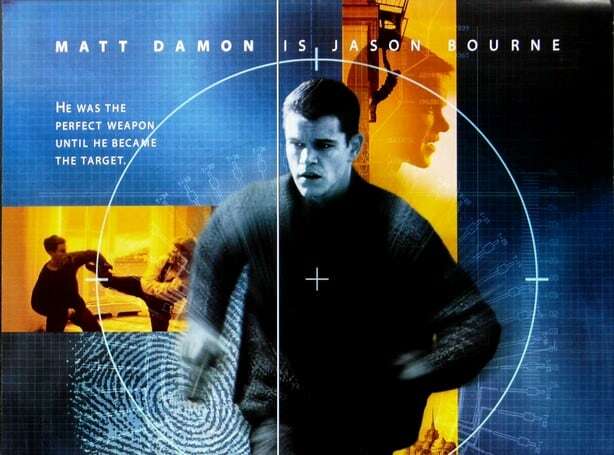 Through continued research and deduction Bourne realizes he was an assassin prior to loosing his memories and now wants nothing to do with the program. Bourne manages to track down the Operation Treadstone safe house in Paris where he begins to remember his last mission while holding the program director at gunpoint. He tells the director he is done and to not follow him; at the end of the film he meets Marie some time later living in Greece. The movie is quite well done and while it does deviate a bit from the original novel it still stands up well on its own. With twenty years between the book release and filming of the movie several things had to be updated to bring the movie into the present day and give it a more realistic feeling. Matt Damon is quite good as Bourne, playing the confident yet still confused character as he works to find out who he is and what is the goal behind Operation Treadstone. There is action aplenty throughout the movie and good chemistry between Bourne and Marie. The film did well and has spawned three sequels: two with the Jason Bourne character (The Bourne Supremacy and The Bourne Ultimatum) and a third, The Bourne Legacy which is an expansion of the Bourne universe with Jeremy Renner in the starring role. While Bourne is in the bank in Zurich going through his safe deposit box in among the cash and passports (and the gun) is a quartz wrist watch, which Bourne puts on his left wrist as he cleans up the contents of the box. The watch is a TAG Heuer Link chronograph, reference model CT1111.BA0550; interestingly, watches with this reference have two different dials. As an international assassin/spy stashing a watch away is a smart idea, especially a quartz one; as long as it is not left for too long there is a strong chance it will still be running when it is needed. In the case of this TAG Heuer the quartz module inside is the ETA 251.262 quartz movement. It is a 7 hand movement with the date dial at 4 o’clock and 27 jewels. Bourne wears the watch throughout the film and it can be seen in several scenes, the best shot is right when the safe deposit box is dumped out. While a good choice for a modern day spy, the watch in the film differ quite a bit from the 1980’s novel. In fact, there were two watches in play in the original novel. The first watch comes about when Bourne is in need of better attire early in the book, and he is able to locate a gentleman with a similar build to his own. The watch, as it turns out, was a gold Girard-Perregaux that Bourne took along with the clothes. Although there is no other description of the watch given the position of the Marquis character one can assume it was a 14k gold dress watch. Not quite the watch for a spy, really, and Bourne realized this as well as the monetary value of the watch. And half an hour later the gold Gerard-Perregaux was no longer on his wrist, having been replaced by a Seiko chronograph and eight hundred francs. Everything had a value in relationship to its practicality; the chronograph was shockproof. Seiko began making quartz chronographs after 1980 so the safe guess here is that the chronograph in the book was either a 6138 or 6139 automatic Seiko chronograph. An additional clue to back up an automatic watch comes later in the book: “Jason kept his eyes on his watch, the infinitesimal jumps of the thin, delicate sweep hand too agonizingly slow.” Beyond this reference the only other mention of the watch is “the radium dial of his watch” when he once checked the time. Given the time of the book, and the scenario in which the watch is acquired, the Seiko seems an excellent choice for Bourne. The watch was picked up in a store rather than from a hidden package. Conversely, for someone stashing a watch a quartz is a better choice for grab and go as there is no worry as to needing to set the time in a hurry. Whichever case it is, the choices seem quite logical and either way Jason Bourne had a nice timepiece to accompany him on his adventures.